Because Deborah Kerr's Tea and Sympathy is one of my favorite dramas, I couldn't resist seeing the off-Broadway production at the Clurman Theatre. 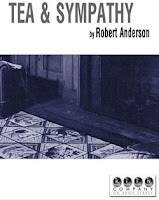 Tea and Sympathy, by Robert Anderson, is a story about a young person struggling with his identity and an older woman unsure of hers, is inherently high drama. Unfortunately, this production by the Keen Company wasn't up to par. Heidi Armbruster's "Laura" was stiff and a bit cold, and too mechanical. Dan McCabe's "Tom" was unnecessarily awkward. Rather than playing Tom as an awkward, unsure teenager, his own awkwardness on the stage overpowered the subtle undertones of whether the boy was homosexual or just effeminate. The play picked up steam toward the end and all was not lost, saved by a supporting cast of Brandon Espinoza as Tom's roommate "Al" and Craig Mather's as Laura's husband "Bill". I could feel the audience waiting for that famous last line, and I sure Heide knew it too, "Years from now, when you talk about this - and you will - be kind." The delivery was appropriately hesitant. However, this production lacked the quality of off-broadway and felt more like community theatre. Perhaps my expectations were too high, but this production was hardly worthy of its incarnation. In 1953, Robert "Bob" Anderson gave a copy of his new play Tea and Sympathy to Deborah Kerr with a note clipped to it, "I wonder if you remember me. I spoke to you about appearing in a play...you said then, 'in five years' time, perhaps...' Here is the play." Deborah read it and loved it, but thought that she was not suitable for the role. She did "not want to play another good woman and wear out one more cashmere sweater." She set the play aside to work on From Here to Eternity. When she finished Eternity, she was released from her contract at MGM and was free to do the play. But Elia Kazan, who would direct the play on Broadway, did not want a "glamorous movie star". Bob Anderson was able to convince both Deborah and Kazan that she was right for the part. He asked them to meet. "The met...had tea, I believe, and he wired me: 'You're absolutely right, and she's going to do the play'." Tea and Sympathy opened at the Barrymore Theatre on September 30, 1953, coincidentally Deborah Kerr's 32nd birthday. John "Jack" Kerr, no relation to Deborah, played the role of Tom Lee and Leif Erikson played the role of her husband Bill. In 1977, Bob Anderson said, "What a birthday she gave us all! As everyone knows, she was magnificent in the part of Laura Reynolds; she received a standing ovation and Broadway took her to its heart. In addition she was an exemplary star, never letting down, an example to the rest of the cast. It was a very happy company, and she played for two seasons, one on Broadway and one on the road, without missing a performance. It is now closing on twenty-five yeas since the play opened, and I can still see her as the curtain rose, luminous with her great beauty in the warm and cosy set by Jo Mielziner...listening to John Kerr playing the sad tune The Joys of Love. And later, in the second act, in the lustrous dark green dress, trying to keep [Tom] from going out to the prostitute. And finally, in the last act, first blazing away at Leif Erickson with 'I resent this judgment by prejudice'...to her last quiet moments with the boy in his bedroom as she undid the top button on the famous pink blouse as the lights irised out. It was an enormously satifysing experience. I think rarely has a play and playwright been so faithfully and lovingly served as by Deborah, John Kerr, Kazan and Mielzner. I was certainly spoiled for the rest of my life." John Kerr won a Tony for his performance. Deborah left in 1954 and was replaced by Joan Fontaine. The play continued to run until June 18, 1955, clsoing after 712 performances. Deborah and Don Dubbins, as Tom, toured with the play throughout the United States for eleven months. The only place it didn't play was Boston, because it was banned there for the subject matter. Robert Anderson wrote the screenplay of his own play for MGM and it went into production with the original Broadway cast of Deborah Kerr, John Kerr and Leif Erickson in 1956 under the direction of Vincent Minnelli. Bob Anderson says of their film of Tea and Sympathy, "Of course I am delighted to have her performance preserved in the film. The picture didn't come off as well as we had hoped...we had to make too many changes for censorship. We kept fooling ourselves that we were preserving the integrity of the theme, but we lost some of it. I feel that the stage production was indeed beautiful, and brought out the harshness and whatever bite the play possessed, while the film bordered on the pretty. But it serves its purpose in preserving the performances of Deborah and Jack Kerr and Leif Erickson." This is a story I identify with because I had a dear friend in high school who struggled with his own identity as a gay teenager. I was his "Al", although he never admitted to me until years later that he was, in fact, gay. I stuck with him and stuck up for him in a small town where being a jock was everything and anything else was not only not to be understood, but also unacceptable. I remember seeing Tea and Sympathy on cable when I was in high school. I remember realizing what was going on with my friend. Fortunately, time has passed and those days in spent in a closed-minded community no longer matter for my friend, but I imagine there are still young people struggling with their own truth, whatever it might be. I still find myself watching Tea and Sympathy when it comes on cable. And in the end, it's one of those stories that many of us can relate to. Historical Source: Deborah Kerr by Eric Braum, 1977.